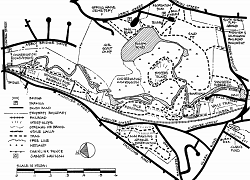 The Ann Rawlins Greene Reservation features a high ridge that extends its length, a continuation of Indian Ridge, a glacial esker. It is forested with young oaks and other hardwoods. After the leaves have fallen the ridge offers views of the Shawsheen River. This parcel of land was owned by John Gardner Greene, who's family roots in Andover can be traced back to the 1860's. He lived in Boston and Florida but kept a cottage in Ballardvalle, including the present Ann Rawlings Greene Reservation area. He was good friends with Harold Rafton and through Rafton was introduced to AVIS. In 1963, Greene decided that upon his death, his land should be given to AVIS with the stipulation that it be named after his wife, Ann Rawlins Greene. John Greene died in 1969 at the age of 64 and AVIS received the land from his trust. The house on the property went to the Andover Education Association, which used it for several years, but eventually sold it. Between Bannister Road to the south, Andover Street to the east, and Dascomb Road to the northwest.